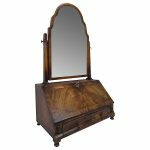 Circa 1880, Victorian Aesthetic revival amboyna davenport with ebony and boxwood banding. 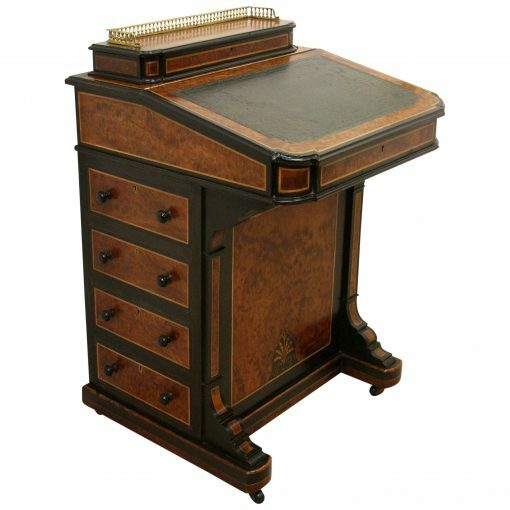 The top is surmounted by a gilded brass gallery and opens to reveal a stationery compartment. The flap opens to show a birds eye maple interior. Below this are 4 drawers opposing 4 dummy drawers with knob handles. 86cm high x 56cm wide x 56cm deep.